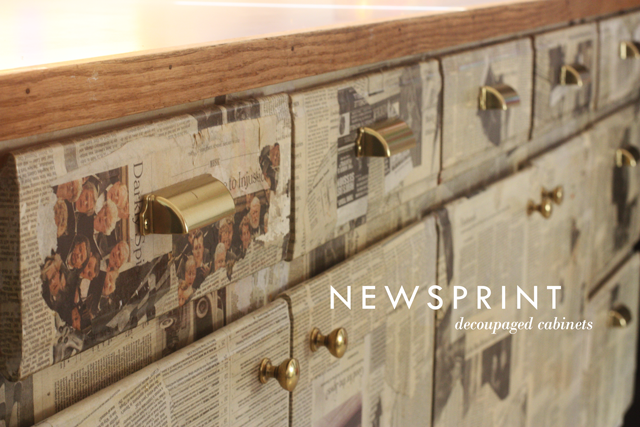 So, this thing happened last spring wherein I decoupaged my kitchen cabinets with newspaper. You didn’t see that one coming did you? Newspaper and ready-made cabinets dancing together in some unorthodox swirl of muskrat love. How’s that for a Wednesday? 1. Dude, wtf? 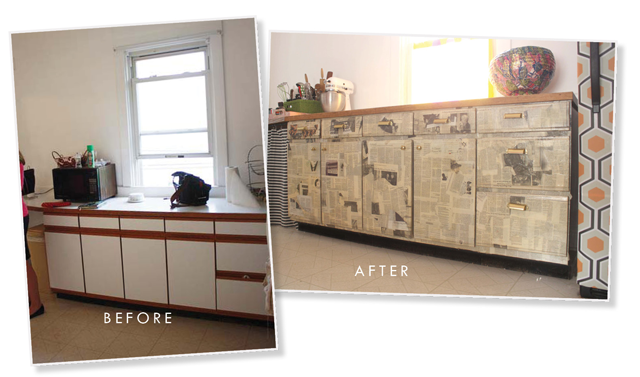 Why would you want to decoupage your cabinets like some reject TGIFridays? Couldn’t you just paint them like a normal person? If I hated it, I had a plan B. It was called Ikea. This room will likely get a larger overhaul down the line, but for now, this is fun way to bring the funk to a boring old kitchen. 2. This is from a year ago? Why are you telling me about it now? I wanted to be sure it would stand up to a year of cooking and cleaning before I recommended this method to anyone else. You know? That’s important sometimes. It annoys the crap out of me when DIY bloggers post about stuff knowing that the results won’t withstand the test of time. I mean, okay, that’s one thing when it’s some crafty doo-dah, but kitchen cabinets are the real deal. I don’t know that anyone reading this will actually attempt to decoupage their cabinets, but if they do, I don’t want some chunk to fall off in their spaghetti sauce. Quality counts. They have been splattered, scratched, picked at, roughed up and scuffed up non-stop for one year and they are just as good as ever. A month after the paper went on I sealed with outdoor Mod Podge, but that was it. I kept some newsprint as scrap in case I need to patch something someday, but so far it has not been necessary. The one thing that did change was the newsprint – it went from grey to yellow in just a couple of months – which is what I wanted, so that’s fine, although it made me switch the hardware to brass a while back. Yes, I’m a fickle one. One part Diet Coke (could swap for Dr. Pepper or Coffee or whatever, you could swap for water) ….Why Diet Coke? I wanted the acid in the soda to set off the acid in the newsprint and make it yellow faster. Initially I wanted to have old-looking newsprint with new-looking hardware. Then that looked weird, then I tried some stuff, then I settled on old-ish brass. Well, aren’t you glad that got sorted out? Prepare for this project to take over your entire kitchen for at least two days. This is the same as any other decoupage project only bigger; slap on the glue, slap on the paper, slap on some more glue. If you are not familiar with basic arts and crafts decoupage, please, for the love of sequins, start there there before you embark on a major project like cabinetry. It’s easy but don’t bite off more than you can chew. Use your fingers to smooth things out after the brushes are done. Use a lightweight paper and crumple it up beforehand (the crumples will allow the paper to absorb the adhesive better and give a smother finish). Use a finishing sealer. 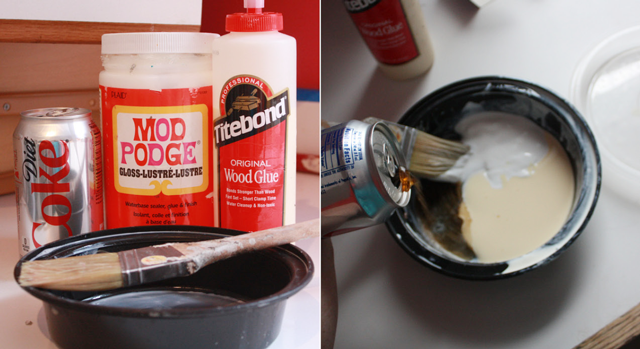 I thought mixing the woodglue into the adhesive mix would stand up to wear and tear — and it did on the fronts, but around the edges it started to get a little frayed. After the cabinets cured for a few weeks I used outdoor Mod Podge (–it’s easy to control, but you can get spray-on finishes just about anywhere). If you really do this, the adhesive is everything. Everything. The adhesive recipe I use to attach paper to melamine front cabinets might be different than the one you use to attach fabric to poly-sealed wood cabinets, or glossy magazine paper to metal. Stuff varies. Do a test patch and let it set a week before doing the whole thing. Okay, okay? And if you do try it, send me a picture! Oh. my. gosh. Diet Coke in the mixture? never would have thought of that, love it!! And you are right…too many post projects that haven’t been tried and tested. I’m guilty of that. Note to self, hold it for later when you know what happens. You are a doll for waiting a year – I absolutely freaking love that. The cabinets have just the right amount of yellowed age! From Diet Coke!?! You fabulous weirdo! I love Diet coke so much. Too much! Do you think I could use it to marinate fake pearls or something to wear? There must be other ways to craft w Diet Coke! JUST SAYING…I am going to do this! I have a falling apart melamine kitchen and really, it couldn’t look worse. I will probably use book pages. Seriously, thankyouthankyoutahnkyou. This had me laughing out loud! “Mod Podge this mo fo!” is now a part of my lexicon. Great idea, and even better that you waited a year to see how it would hold up long term. Your cabinets have much more personality now! You are really a very patient person to wait a year before posting this. I know, right? I was thinking about that. Leather kitchen cabinets would be pretty awesome! Love. It. Girl. It reminds me of being a kid at Wendy’s with the newspaper topped tables. This rules!!! OMG I was trying to remember other places for newsprint collages..that’s it, WENDY’S!! I was thinking it was Bennigan’s. Nope, Wendy’s for sure. You are amazing! I’ve got a kitchen with a bad case of the uglies too. They’ve gotten painted twice and are likely headed for a third round. So much better to live with until my lottery winnings come through and I can rip the whole thing out. BTW mod podge, likely a clever alien invention. You are a very brave lady and I give you props for this project. Do you think you’ll be adding layers to the newsprint once you get tired of the look? Mod Podge and maybe some items found in the “junk drawer” perhaps? In reference to eateries that had newspring collages, I seem to remember a hamburger chain, many moons ago, I think it was called “Wimpies”. They were known for burgers and their sundae bar. At first I thought, this looks horrible! And then I saw the pulled away view with your fridge and it actually looks pretty great. I would never have thought to do such a thing. It’d be nice with old book pages, too. I am actually right in the middle of putting pages of an old dictionary onto a big wooden cabinet in my living room. I have already done the same to our surround speakers, whose fake wooden finish didn’t go so well with the dark floor. I love the speakers but am not so sure about the cabinet yet. I hope it will look better when finished. I “wallpapered” my bathroom wall with slightly naughty jokes I printed out or cut out of magazines and newspapers. Looked great! Downfall…people were spending too much time in there giggling. Was awkward. *sigh* This is why I need to get rid of my husband LOL. Sort of. You are one amazingly amazing person and seriously your blog has been the best one EVER to follow, for me, the past few years! You go girl!!!!! My kitchen looks like glowing 70s vomit. I was planning to murder the ugly with white and blue paint soon, and I love this idea so much. I’ll almost certainly use it. My kitchen looks like glowing 70s vomit. I’m planning on murdering the ugly with white and blue paint soon, and now I’m seriously considering using this idea. Ok, MAD props for taking on the cabinets!! My friends thought I was insane for mod podging the fridge…looked great though. ;~) I went with Beatles sheet music & a few photos, but now I’m lovin on the newsprint! Stumbled onto your blog from pintrest a few minutes ago & fell instantly into fandom. Thank You!!!! MAD props to you for taking on the cabinets! 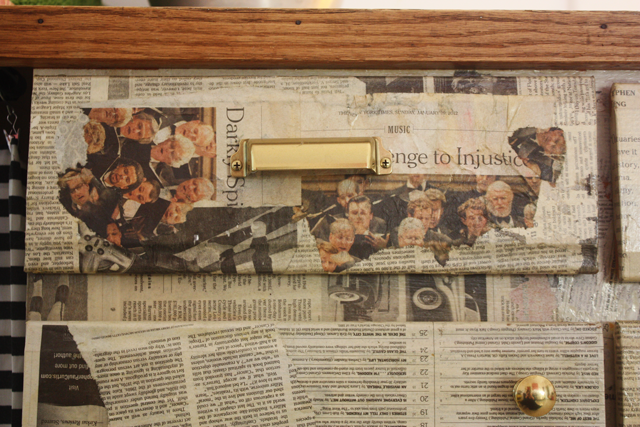 I did my fridge with Beatles sheet music & some photos a few years ago…I loved it! Sadly, the fridge died & roomate won’t allow me to mod podge the new one. Missin that fridge now. I love the newsprint & am so glad pintrest led me here!! Looking forward to seeing whatever you come up with next! Thank You for sharing!! Good morning Peaches, I love this project you did !! I want to do my old cabinets that are white. Could I use scrap booking paper? I found some that looks like crackle and I really want to use it. The size of paper is 8 1/2 X 11 but is thicker than newspaper so not sure would work and also not sure about diet coke for aging. Thank you for sharing your project and I hope I can make this work in some way. Maybe you could tell me of other paper that would work for me. Thank you and have a great day! !